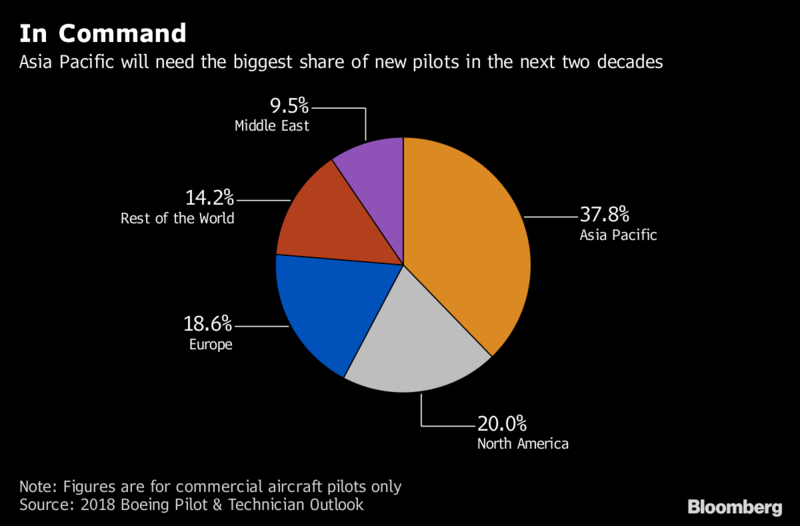 According the last forecasts, the Asia Pacific will need the greatest number of pilots, technicians and cabin crew over the next two decades. The region’s economic growth will lead to rising wealth and increased travel, spurring a need for 240,000 more pilots and 317,000 cabin crew by 2037. China will need half of these new personnel. The projections place pressure on an industry that is already struggling with a pilot shortage and training bottlenecks. Older pilots are set to retire over the next decade and there is increasing demand for business aviation services, such as helicopter tourism and private luxury jets. Boeing estimates China will need 128,500 pilots, Southeast Asia 48,500 and South Asia 42,750 pilots. Boeing’s outlook is used to create projections for new airplane deliveries. Unsurprisingly, the Asia Pacific will also lead global demand for new planes. The US aerospace and defence giant projects that 40% of all new passenger planes will be delivered to airlines in the Asia Pacific over the coming years. Boeing has an accelerated pilot development programme but their pipeline will not be enough to meet the growing industry demand. Analysts warn the shortage of pilots puts the aviation industry’s growth at risk.Pilots’ demand for higher salaries will also cut into profits. In countries where there are strong labour unions, such as the UK and France, demands for increased pay and benefits have led to debilitating strikes. The aviation industry also faces turbulence in the form of global trade wars. This entry was posted in News and tagged -, 000, Asia, decades, needs, next, over, pilots, two. Bookmark the permalink.